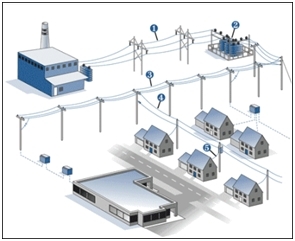 The distribution system is vastly spread in the present age with the primary circuit starting from a sub-station and ending at the customer’s home. At this moment it is known to be the secondary service. The voltage being received by the customer is of low voltage than that starting from the sub-station as it is divided to many customers along the way. The voltage being utilized falls within the range of 2300- 35000 volts with huge dependence on the distance it has to cover, the amount of load and the utility standard practice. This makes the voltage distribution most suitable to less far areas. The voltage transmission is usually carried out at high voltage. The high voltage first enters a transformer which is placed in a sub-station; the voltage gets reduced and after that distributed to various locations. Overhead pole lines or underground networking both ways can be utilized for the placement of conductors to be used during distribution.